Whitney Port shared a photo carrying an Ana Mari Ortega handbag on her blog. 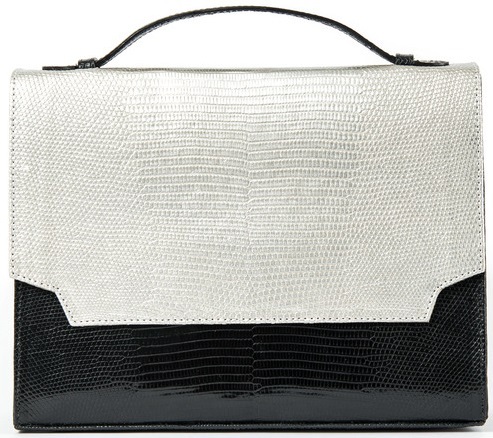 The designer showed off a street chic look with her Jamie Metallic Silver and Black Lizard handbag ($798, www.anamariortega.com). See more of Whitney Port. Here is a closer look at that gorgeous handbag. Thank you for taking the time to read our designer handbag blog post. We hope that you have found this celebrity news to be informative. You can learn more about Whitney Port at her website. If you have comments or questions, please add your thoughts in the discussion area below. Thank you for taking the time to learn more about the handbag carried by Whitney Port here on the Fashion Blog. We are truly happy that you stopped by to read this fashion blog post regarding this amazing Ana Mari Ortega handbag.